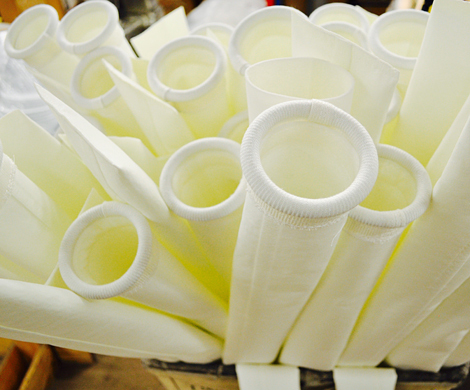 We use high-tech filter media to fabricate liquid filtration products. We inventory these products along with many standard fabrics for prompt delivery. We perform stringent inspections during the manufacturing process and again prior to shipping. We provide liquid filtration solutions to many industries including wastewater management, pharmaceutical and food & beverage. We are a leader in the manufacturing of press belts for the liquid filtration market. We perform stringent inspections during the manufacturing process and again prior to shipping. We stock many standard sizes and in most cases can ship immediately. We are a leading source for both standard and custom filtration solutions. Fabrics For Industry sells finished, woven-endless belts, and will customize the length of the belt to meet your requirements. We guarantee accurate and uniform belt thickness and uniform splice on all our belts. Fabrics For Industry's product line includes all of the accessories and hardware associated with the liquid filtration requirements. Our accessories include velcro closures, specialty lacing & pin wire, doctor blades, polymer solvent and heavy duty degreaser for cleaning belts and equipment.